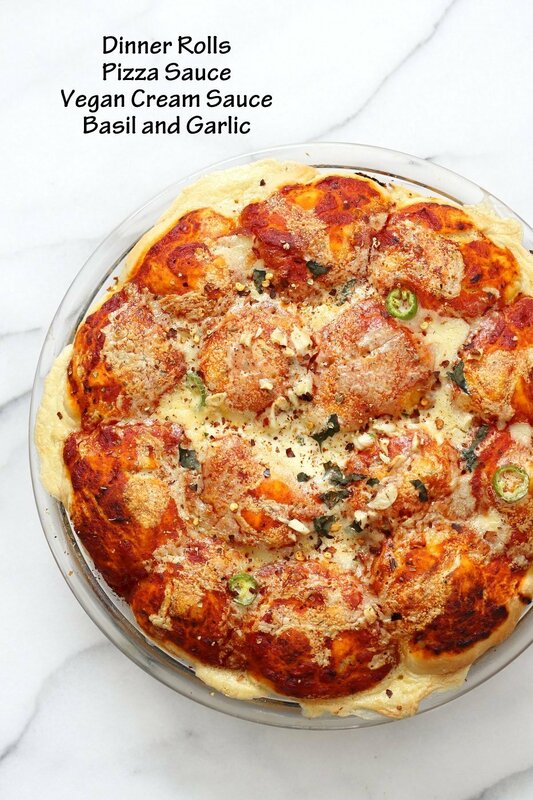 Cheesy Pull Apart Pizza Bread. 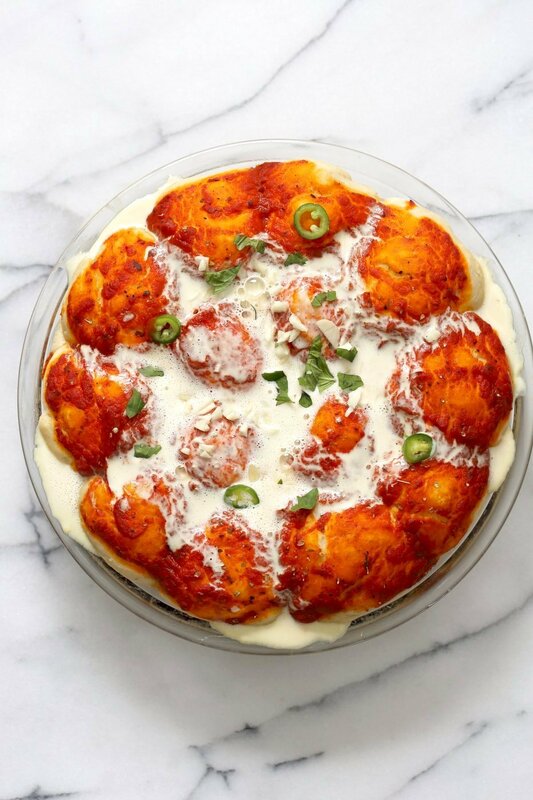 Pizza Monkey bread for parties or light meal. Add roasted veggies, olives, mushrooms to make into a pizza bake. Vegan Soy-free Recipe. These Pizza Rolls are super easy and a great snack to interest and engage everyone at the party. 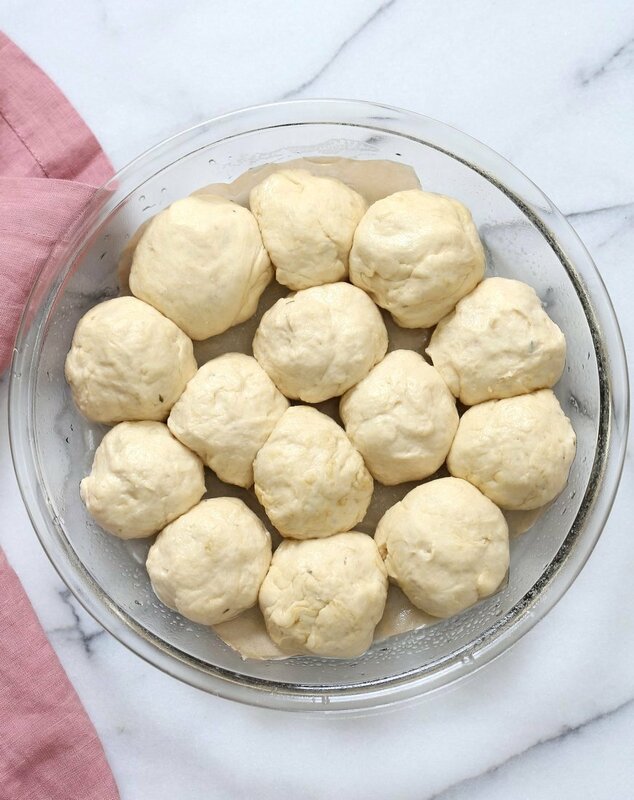 I use my 20 minute pizza dough, divide and roll it into mini dinner roll size balls. Place them in a pie pan, then drizzle a mozzarella style cashew cream from my Pizza Dip (which you must try! its GF), some pizza sauce, more of the mozzarella cream, basil and peppers and bake! The cashew mozzarella cream thickens during baking. The baked rolls are coated with thick creamy cheese sauce, pizza sauce and other toppings if added before baking. They can be pulled out with all the pizza goodness and served. Berbere Chickpea Pizza with tahini garlic dressing. All you want in a wrap, on a puffy pan crust pizza. In other reading, an under cover investigation of a Pet store in new york found sick puppies and abuse. Puppy mills treat dogs as a product. The product line doesn’t care about the mothers who are just machines in tiny cages, that never see the light and live and die once spent, right there. Pet stores often put up a polished view with cleaned up cute puppies, but there is always a horrifying story behind them. We fostered a skinny ribs and skin puppy mill pup some years back and his fear of humans broke our hearts. He took a month to open up to just wag his tail and start to trust us. There are millions of dogs and cats in shelters, even puppies that end up there without any fault of theirs. #AdoptDontShop . Here is a detailed article on the world behind Puppy mills and Pet Stores. Divide and roll into balls and place in a deep pie pan with enough spice to rise to double. Below are balls that have risen for 10 minutes. Keep enough space between the dough balls and use a deep pie pan, else the cashew cream will overflow during baking. Pour more of the cashew cream. Sprinkle jalapeno and some basil. Bake cool for 2 minutes, then serve. 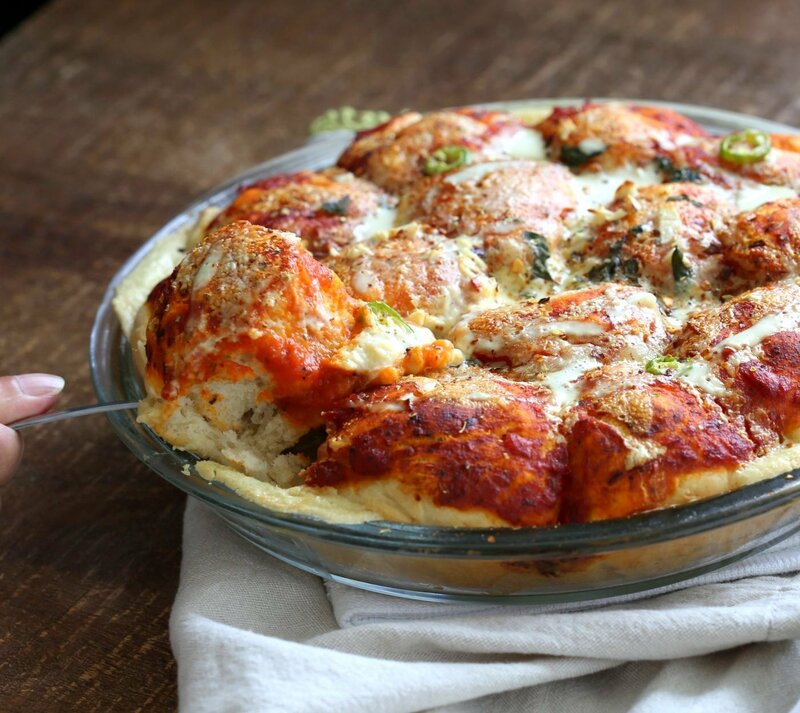 Cheesy Pull Apart Pizza Bread. 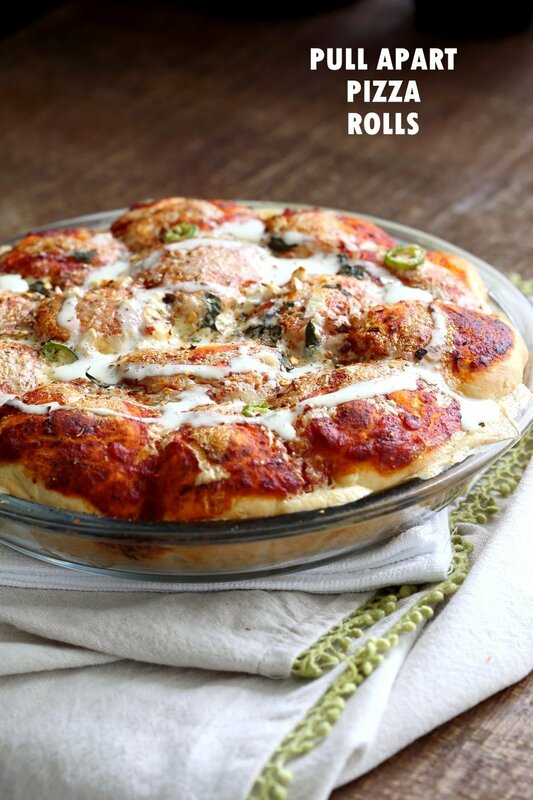 Pizza Monkey bread. Add roasted veggies, olives, mushrooms to make into a pizza bake. Vegan Soy-free Recipe. 1/3 cup cashews (use a heaping up for creamier) soaked for 15 minutes in warm water then drained. Proof the yeast by mixing yeast, warm water and sugar and letting it sit for 5 minutes. Then mix in the flours, salt,herbs, 2 tsp oil until a sticky dough. Add flour 1 tbsp at a time if needed until it is slightly sticky. 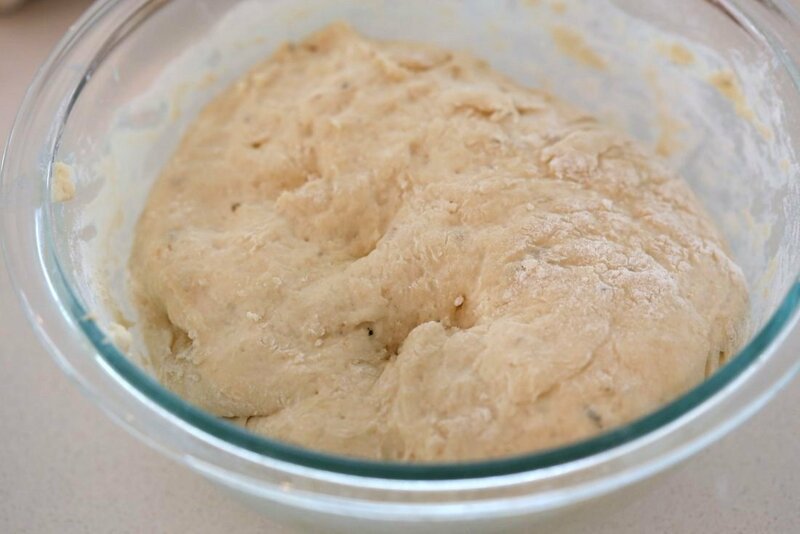 Let dough rest for 10-15 minutes near the warming oven. Preheat the oven to 400 degrees F.
Blend everything under cashew mozzarella cream until smooth. Blend for a minute then let it rest for a minute and then blend again, repeat until very smooth. Taste and adjust salt and flavor. Drizzle oil on the dough and spread. Divide the dough into 12 to 14 portions and shape into small balls. Place in a deep 9 inch pie dish or a 9 by 9 inch baking dish, atleast a 1/2 inch apart. Keep more space between the balls in the middle as the middle gets less heat and the crowding might cause the dough to not cook through. If all of the balls dont fit, freeze the rest wrapped in plastic wrap, to bake into dinner rolls later. Let the balls sit in a warm place for 5 minutes. Pour just a little of the cashew cream in between the rolls. Spread tomato/pizza sauce on top of the buns. Sprinkle oregano. Bake for 15 mins. Remove from the oven. Add roasted veggies if using between the rolls now. Pour more of the cashew cream over the buns, and more between the rolls that on the top. Reserve some of the cashew cream to add later. Add 1 tbsp chopped basil and sliced jalapeno or olives on top. Bake for another 15 to 20 minutes. Take rolls out of the oven and rest for 2 minutes. Meanwhile, if there is enough cashew cream leftover, heat it in a pan over medium low heat until thickened. Stir frequently to avoid lumps. then drop dollops over the rolls. Or if there is just a bit left, drizzle the cashew cream directly over the hot rolls. Sprinkle fresh basil, pepper flakes and a tsp of extra virgin olive oil. Serve hot. Use a larger baking dish and place the rolls about an inch apart. After the first bake, add some roasted veggies, mushrooms or peppers between the rolls and then drizzle the cashew cream. To make these gluten-free: Use my glutenfree dinner rolls. Bake the rolls, then add the cashew cream and pizza sauce layers and bake for 15 minutes. To make this nut-free: Use Cauliflower Alfredo or Pumpkin seed Alfredo . Add a tbsp of tapioca starch to the sauce. Both the sauces will not be as stringy as the cashew based sauce but should work. For variation: Use the mozzarella from Everyday Kitchen Book, and add dollops on the rolls for extra cheese pizza rolls. When it’s from you, I KNOW it’s going to be good. Wow! This looks unbelievably delicious. I can’t wait to try it. Any substitutes for people who are allergic to tree nuts? You can use Cauliflower Alfredo http://www.veganricha.com/2014/05/cauliflower-alfredo-spinach-artichoke.html or Pumpkin seed Alfredo http://www.veganricha.com/2016/06/pumpkin-seed-alfredo-nut-free-vegan-alfredo.html . Add a tbsp of tapioca starch to the sauce. Both the alfredos will not be as stringy as the ingredients add a chunkier volume, but should work. This looks great! Would it be terrible to leave out the miso from the cashew cream recipe…or could you recommend a substitute? Try the pizza dip then. its a dip that you can serve with vegetables or flourless crackers. Pizza dip ! Never in all my days, not sure my Italian relies would approve but looks good and I will give it a go. Thanks Shirley I have tried one cauli pizza and its OK but not light I might try some of the others you mentions as I have a cheese cauli muffin thats really nice. Have you tried Richas tomato soup just like heinz !!!! I tried these rolls last night http://talesofakitchen.com/breakfast/life-changing-quinoa-avocado-bread-buns/ mine came out rather heavy but I have not given up on them yet, tasted really nice. OOO, avocado- and quinoa-based bread? That’s worth looking into! Thanks Claudia! The pizza dip is the other option. That way you can serve the dip with a gluten-free bread of choice. Gf baking can be tricky and once you have the bread that you like, serve it with the pizza dip. Where can I order the GF rolls?? I love your creativity Richa. It is insane how many of your recipies are so original. I follow many vegan cuisine blogs that are great but with your posts is like I always wanna print all you make. Insane… Not a couple of recipes, but all!!! You are a genius. I have followed you for some time now, and I really enjoy your recipes. I noticed you started adding nutritional information. Thank you! Not very many people bother to include that. I may add spinach and chopped artichokes on top and hope it bakes well. I’ll keep you posted. Hi Richa. Being on holiday & having some extra time I’m gradually going through all of your recipes that I’d bookmarked. I made this today – wowey zowey! Sooo nice! I followed the recipe as it is & it turned out great. That cashew cream, mmm! Thanks so much for everything you share, it’s much appreciated as I know I can rely on your experience. Another delicious recipe, Richa! I made this last night and it was devoured by the fam. Thank you! I made these tonight and I knew they’d be amazing ( because duh, it’s vegan Richa ) but I was still amazed at just how ridiculously delicious it turned out. I added mushrooms and onions on top ???? so good, thanks so much! Have you ever tried this with a gluten free bread option? These were absolutely delicious. Made with all white whole wheat. Sooo good. Thanks Richa!!! I Don’t have tapioca anymore, can I use arrowrootstarch or something similar? I had no tapioca starch for the cheeze sauce, so I tried corn starch, and it worked great. Since I found this recipe a few weeks ago, I have used that sauce on top of all kinds of stuff (cheesy chickenless enchiladas were great), This cheeze sauce is a total game changer! My omnivorous and lacto-ovo veg friends didn’t even know what hit them! 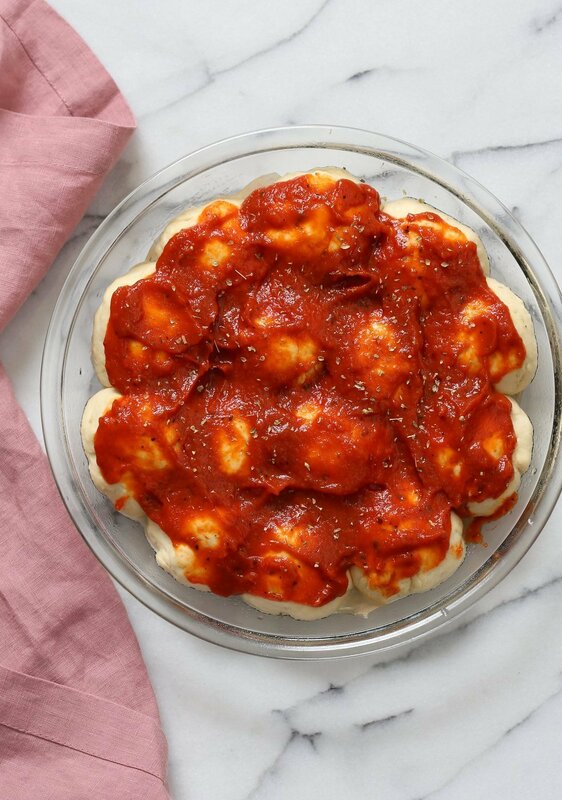 One person said “I would never know this was not the real thing.” Thank you so much for giving me back gooey oven-baked mozzarella through this quick, easy, delicious sauce. Awesome! Try it with tapipoca for a stringier texture, otherwise any starch works in other applications. You can ook it to thicken and use blobs on pizza, and bake as mozzarella! Richa, everything I make from your blog is legit. I have no idea how to make this miso thing. And I don’t really have shops with things like this in my country, so… Can I do the cashew sauce without this? Yes you can omit the miso. Add some more nutritional yeast. Miso is a fermented paste of soybeans or other beans and is available in asian stores. It adds the umami cheesy profile to the mix. I can’t get over how delicious these are! I ended up making them two nights in a row! Made this for dinner tonight and it’s just as delicious as it looks in your picture. My whole family absolutely loved it. We had this with a bean/spinach salad and it was a perfectly delicious main course! I can always count on your recipes to work out and to be delicious. Thank you! Wow! Looks amazing and delicious. Thanks for sharing this healthy pizza recipe. Will try it soon. Hi, how to use the leftover frozen dough? (Sorry my bad English) greetings from Brazil. make rolls next time. or use it to make a pizza. This is delicious and not at all complicated to make. Just takes a little planning ahead, but I like that, to get immersed in the kitchen. The only issue I had is that the rolls stuck to the bottom of my glass pie pan. I think I’ll try greasing it a bit next time. But OH! there will be a next time. Many next times. I was surprised how much the cashew tasted like real cheese! Delicious recipe and looked beautiful. Thanks for sharing!